A jazz icon has expressed his frustration with local musicians at the 7th Annual National Jazz and Creole Festival. Cameron Pierre who was raised in Soufriere and now resides in England briefly expressed his frustration with Dominican musicians while he performed with local band Breve at the festival on May 15. With no intention of dampening his incredible performance, Pierre saved his further comments for the reporters following his performance. "It was fantastic; the audience response was good; it is home for me so it is going to be a different experience from performing in St Lucia; there is nothing like performing in front your own people," said Pierre. He noted that Dominica doesn't have a jazz culture; therefore, an audience will not know what to expect. "I can't complain; if you play rubbish you can't get anything," he said. Pierre then added: "I wasn't bashing Dominica's music just that I got really frustrated. I would have a gig in St Lucia, Martinique, Barbados or Trinidad and I could never find a musician here who was good enough". Thus, he said, it was refreshing to come across a band with a bunch of musicians who he believes have the potential to be amazing. In addition, Michael Low Chew Tung, the keyboardist and manager of Elan Parle said that although they were first to perform at the festival the small crowd present at the time was appreciative of their music. "We played first so the crowd wasn't a big crowd but it was a very appreciative crowd; we were very happy to see some of the members of Breve come in front and really support; a lot people stand on the side, we tried to do our best, we played songs that people would appreciate," he said. Low Chew Tung said that based on the performance his band gave at the festival he feels that they will be invited to perform again. Meanwhile, Andy Narell from the Andy Narell Quartet said that it was his first time in Dominica; however, he was shocked by the large crowd that came for the Jazz festival. "I have been all over the Caribbean but this is my first time in Dominica…it was a pleasure to be out here playing to the crowd there is a lot of people here. 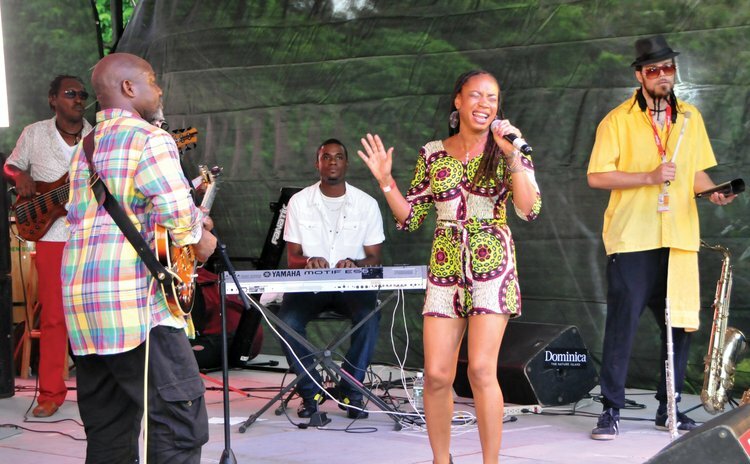 We played in Martinique last night and this is more people that we had there," said Narell. Narell said that he began playing steel pan with his brother at the age of seven through his father's social work initiatives with New York gangs. "The pan was sort of an accidental phase when I was a little kid my dad was doing social work with street gangs in New York and he was looking for things that kids would be interested in doing and he accidently discovered steel pan music," he said. The other bands that performed at the festival were Paix Bouche Drummers, Soft and Cadence All Stars.